This is the very simple circuit diagram of 150W power amplifier. The circuit is easy enough to built without PCB. The power output range is about 100-150W depends to the power supply and the Darlington’s you use for the amplifier. Heatsink is a must since the final transistor is going to hot when the amplifier is activated. The amplifier requires split power supply. The transformer is depending to your home electrical installation, it can be 110V or 220V primary. 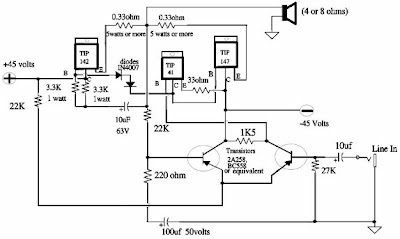 Use 35V-0-35V secondary (transformer output), you will get about 45V DC output from transformer 35V AC after rectified by the diodes. The Transformer current output should be at least 4A for better audio performance. Use 4A / 100V diodes.